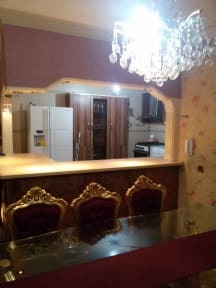 Tehran Heart BnB i Tehran, Iran : Boka nu! after the booking . arrival time must be confirmed through email , phone call or whatsapp communication. We have 2 bedrooms located on the 2nd floor and two another properties are flats located at the basement of the building. Free full traditional breakfast includes fresh Iranian bread, cheese and fruits. We also have 24 hours pick up from/to airport. Make use of our free guide consult about the travel, booking tickets for flight, train, bus and accommodation in other cities. Tehran Heart BnB is exactly located in the center of Tehran. It is in heart of Tehran, close to metro and bus station, easy access to west,east, south and north of Tehran by public transport. The area is the main area in Iran, most of traditional events, politic and social events have been held around Vali Asr Square. The place is full of cafes, restaurants, shops... every day young generation get together around. It is close to attractions, concert hall, theater center, art galleries, social meetings. 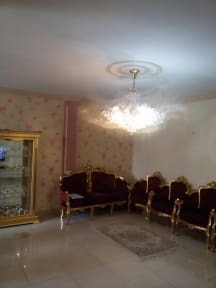 The rooms are equipped in double beds, central heating, air condition, closet, laundry, iron, mirror, hair dryer, bathroom, western toilets, lockable door, bath tub, drawer, towels. They are family and children friendly and handicapped friendly. An elevator is in the building. 24 hours warm shower. after the booking , must be confirmed your booking awareness through email , phone call or whatsapp communication . Taxes not included - 3.00% will be added.